Thunder series earmuffs are designed with all-day comfort in mind. Thunder headband earmuffs feature a unique dual headband for better positioning and breathability, and a non-deforming outer headband that minimizes pressure on the head. Plus, its dielectric construction withstands use and abuse, while protecting workers in electrical environments. The Thunder series features patented Air Flow Control technology for optimal attenuation across all frequencies and also snap-in ear cushions for easy maintenance. Howard Leight's patented Air Flow Control delivers optimal attenuation across all frequencies, without increasing ear cup size or weight. A patented base plate chamber and high-tech non-woven layer manage the flow of air inside the earmuff to control how sound reaches the ear. The result is better, more consistent overall attenuation for virtually all industrial noise environments. 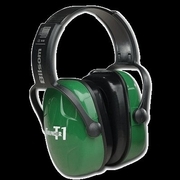 Air Flow Control is a standard feature on all Thunder series earmuffs.